I've just finished watching "Ferris Bueller's Day Off" (probably for then 15th time) and it's possible that I'll watch it a couple more times in the years to come: the movie is so much fun and an absolut classic. 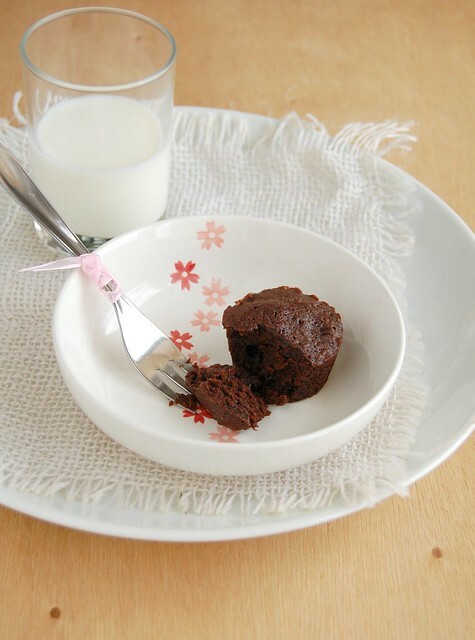 I love classic movies (most of them) and I love classic desserts like brownies, which are an American classic and nowadays are extremely popular here in Brasil, and this bite-sized version not only is delicious with the bits of dried cherry but also they're so cute! And they pop out of the molds so easily you don't have to worry about making perfect slices or squares. Place the cherries in a small bowl and mix in the rum. Let steep for 1 hour. Preheat the oven to 165°C/325°F. You’ll need fourteen lightly buttered ¼ cup capacity silicon molds or mini muffin pans – I used silicon molds and the brownies were easy to unmold; they’re very moist so I guess it would be difficult to unmold them from metal pans. Place butter and chocolate in a small heatproof bowl over a saucepan of simmering water and stir occasionally until melted and smooth. Transfer to the large bowl of an electric mixer. Add the cocoa, beat in medium speed to incorporate, then beat in the sugar until smooth. Beat in the eggs and vanilla. When incorporated, beat in the cream cheese until only small bits remain. Add the flour and salt and mix only until the flour is fully moistened. Drain the cherries and stir them into the batter. Fill the molds about ¾ full and smooth the tops. Bake for 12 to 15 minutes or until the batter has set. The batter will puff and rise a little above the top of the cavities but sinks slightly on cooling - if pressed lightly with a finger tip they will spring back. I love cherry with chocolate, these little bites are too cute! A brownie is always a winner. Love bite size pieces of everything It's such an elegant way to eat. I LOVE cherry and chocolate.